A kitchen is one of the most important rooms in the house. For food lovers, it is one space you want to keep squeaky clean at all times. I mean, speaking from personal experience, a clean kitchen always puts you in the mood to cook! 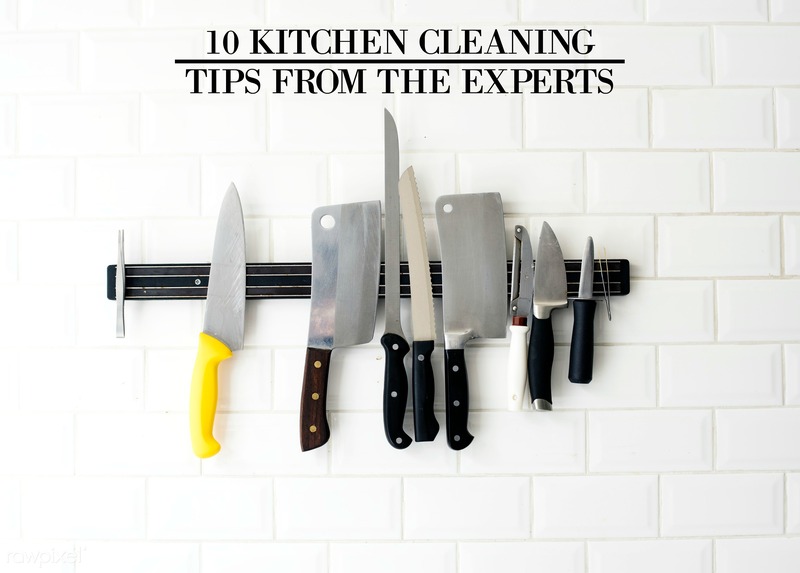 And in this article, we’ll share ten non-costly and in fact time saving tips that will help you keep your kitchen clean at all times. So you’ve probably come across ads or scenes in TV shows where a short spray of a cleaner and a swift dash of the napkin over the surface to be cleaned does the job. Well, we are here to tell you that just as you do need time to do your work, cleaning products do need time to do their work too! And to improve the shine and overall look of your surfaces, cleaning tips and home hacks advise that you spray the surface with your cleaner then allow a few minutes for the cleaner to work on the surface before wiping it clean (water can do the trick too!). You can get rid of tarnish on your copper and brass pots, pans, fixtures etc. by just dabbing some ketchup on to a soft cloth and rubbing gently on the surface to be cleaned. You can finish by rinsing off the utensil with warm water. Hydrogen Peroxide can be useful for removing coffee and juice stains from your kitchen. According to a renowned kitchen designer Florence Perchuk, putting hydrogen peroxide in water plus a few drops of ammonia should do the trick. Even though you feel your kitchen needs a thorough cleaning, experts have advised that it is better to go for gentle cleaning liquids and not harsh ones that may cause damage to your tabletops or leave harsh smells in your kitchen. A very useful hack kitchen experts seem to endorse. It is advised that you double line your kitchen bins so as to help save time that would otherwise be spent on cleaning out the bin in cases where the first bag gives way. For splatters, cleaning experts suggest that as you clean, you take a paper towel or a wet cloth to the oily or water based splatters, and use a mild dishwashing liquid with water to do the trick. Marty Hoffman from Hoffman Brothers Floors suggests that you can create a homemade cleaner from baking soda and water which you can use to clean tile floors. To try this, pour half a cup of baking soda into two gallons of water, mix then it will be ready for use. Experthometips.com suggests that if you have tiny gaps between the stove and counter, you shouldn’t allow food to fester for ages in there! Get a knife to work the dirt out carefully and easily. Stephen Fanuka shares this tip he learnt from an old cleaning lady. For a maximum shine on your wood floor, mix a bucket of nine parts warm water to one part white vinegar and you’ll have a beautiful floor. Now if you have any questions about these cleaning tips, just let me know in the comments down below! I’d love to help out!